The only thing worse than losing is losing by the smallest margin possible. No. 12 Cal beach volleyball came just two points away from beating No. 7 Cal Poly Mustangs on Saturday in the middle of a weekend that also saw them defeat No. 9 Long Beach State 49ers and fall to No. 5 Pepperdine Waves. 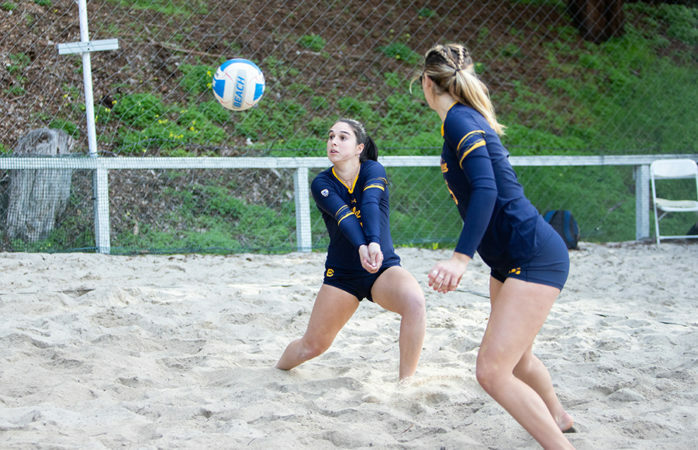 The two days of play started Friday when the Bears traveled down to Long Beach for a morning match against the first of three southern Californian competitors. The first two pairs up were No. 2 sophomores Caroline Schafer and Maddie Micheletti and No. 4 senior Mia Merino and junior Abby Waldburger. Both lost. Now at 0-2 with three matches to go, the remaining duos all knew that a team victory was reliant on their own individual success. Cal’s No. 5 duo of junior Madison Dueck and sophomore Alexia Inman got the job done 21-15, 21-17. No. 3 senior Grace Campbell and junior Iya Lindahl followed suit with an easy 21-14, 21-11 win. Now, it was all down to one team. At their teammates finished up, Cal’s No. 1 pair of sophomore Mima Mirkovic and freshman Jordan Polo still had a third set between them and a team win. Cal had taken the first set 21-18, but Long Beach came back with a decisive 21-12 win to tie up the match. It was up to Mirkovic and Polo alone to keep that energy and take the third to secure an overall Cal win. They fought hard, and the pair’s chemistry and season experience shined through in their ultimate 15-10 win. This victory against the 49ers was momentous for the Bears, as it was only their second win over a top-10 team in program history. They were less than 24 hours away from facing two more of the best teams in the country, and this initial win showed promise moving forward. While that promise made Cal more competitive than ever in their next two matches, it would ultimately not be enough to earn them anymore upsets. The next day, the team traveled up the coast to Malibu for the Pepperdine Invitational. Their first match saw them come face to face with Cal Poly, a team that has maintained their top-10 rank this season with strategic wins, though occasionally falling to an unexpected competitor. After the first four matches, the Bears and the Mustangs were tied. Cal’s No. 1 and No. 2 pairs had fallen while No. 3 and No. 5 rose to the occasion, each with a two-set victory. The win, once again, came down to one game in the third set. Merino and Waldburger took their first set in a close 23-21 affair, while the second saw them fall decisively, 14-21. The third set went back and forth until the duo let go of one last point and lost the match by the smallest margin possible, 13-15. While the loss was disappointing, the fight of the Bears showed their ability to compete against ranked opponents and displayed their improvement this season. Cal still had one match left for the weekend against the host team, No. 5 Pepperdine. The only team to win their match, though, was Dueck and Inman. They fought through three sets, winning the first and then taking the third in a close 15-13 victory. With matches left against Cal Poly and No. 20 Stanford followed by the Pac-12 Championships, the Bears only have a few more opportunities to attempt an increase in rank and put themselves in a good position to achieve one of their biggest season goals — qualifying for the NCAA National Championship. After this weekend, however, they are just as far from qualifying as they’ve been this entire season. Alison White covers beach volleyball. Contact her at awhite@dailycal.org.